Ball & pillow in cleaved Swift Run Formation? On my structural geology field trip this past weekend, I made one major modification compared to last year’s iteration. 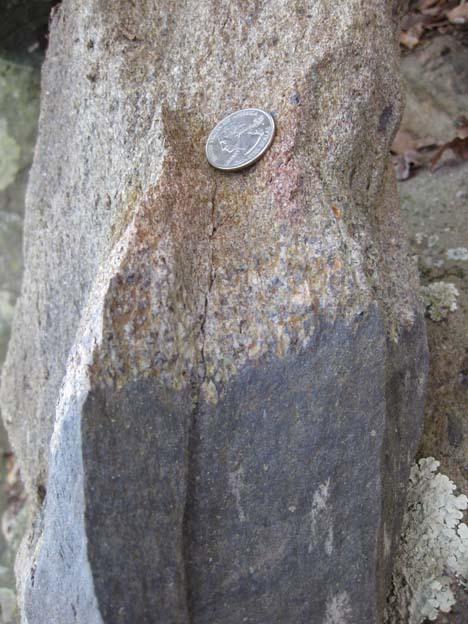 I added a fifth detailed “field study area” at an outcrop of the Swift Run Formation, a Neoproterozoic sedimentary unit that is discontinuous in extent between the underlying Blue Ridge basement complex and overlying Catoctin Formation meta-basalts. A month ago, I didn’t know about this location, but I was introduced to it by Chuck Bailey on the Transect Trip last month. 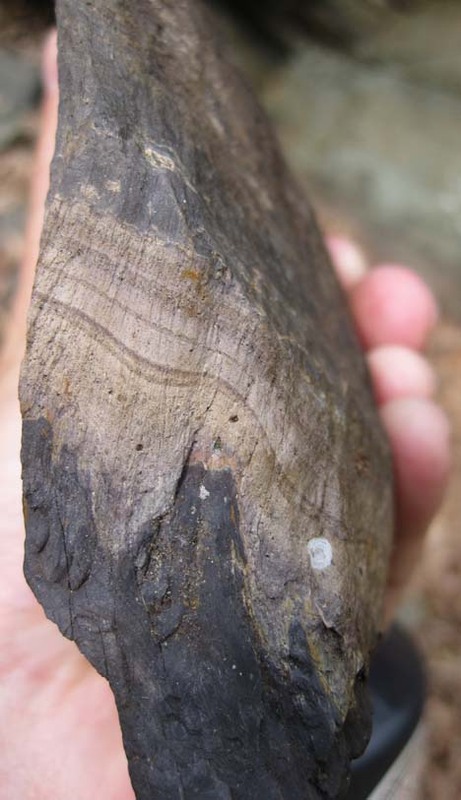 It’s a perfect complement to my structure students’ detailed examinations of the units above and below it, and the outcrop offers an embarrassment of rich structures to measure, both primary and secondary. Here’s something I spent some time pondering: are there ball-&-pillow structures preserved in the Swift Run? We definitely see the ‘coarse-sand-dumped-on-mud’ set up that will lead to soft sediment deformation (sagging of heavy sand downward into squishy mud) under the right circumstances. 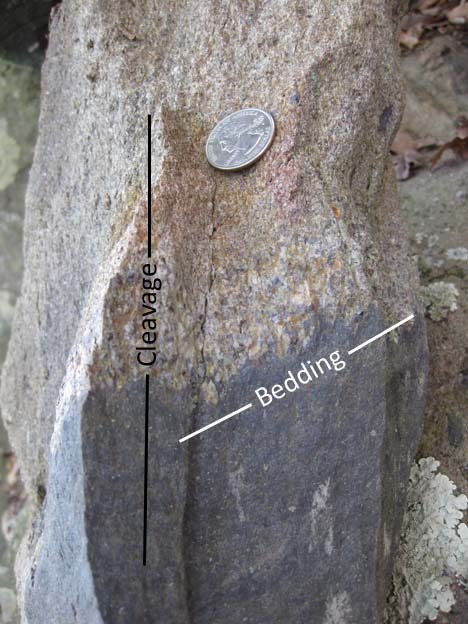 Here’s a second sample, as viewed on the edge where cleavage and bedding intersect. The little white dot is some kind of arthropod egg case; ignore it. I would not expect a structural re-organization of the bedding trace as viewed on the plane of foliation, only 90° to it. So the fact that the second sample shows the wiggles continuing around all exposed faces suggests to me that it is indeed a primary feature, but the alignment of the most-vertical parts of the sags was accentuated by the development of cleavage, as seen on the first face. 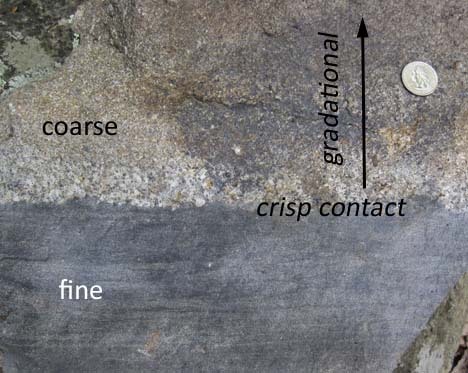 This interpretation is backed up by the observation that the basal part of the sandy unit (the coarsest part) varies not only in position, but also in thickness as you trace it out around all sides of the sample. I’m not entirely satisfied with this interpretation though, because of the asymmetry and small-scale “parasitic” wiggles on each of the potential sand “pillows.” Furthermore, when I’ve seen true ball-&-pillow soft-sediment deformation structures in the field, the mud that squishes up is typically in a cuspate form, in stark contrast to the lobate blobs of sand that sink down. Here in this Swift Run sample’s foliation plane, the shape character of the ups appears to match the shape character of the downs. 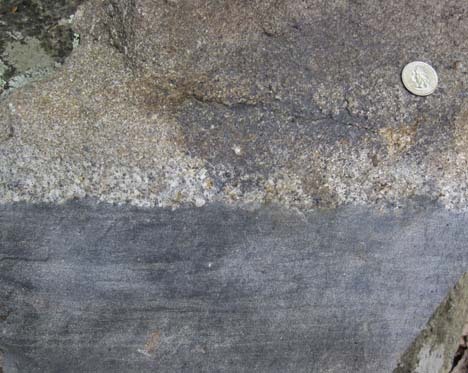 On the first view (looking parallel to the bedding/cleavage intersection), however, I suppose one could argue that the mud approximates a flame structure (cuspate) while the sand pillows look more lobate… but with the cleavage overprint, it sure isn’t super obvious. Anyone else want to chime in on these two samples? Observations? Interpretations?